Olympia. Thank God. It is over. Finally! And well over too. Congrats to the Chinese people. No major loss of face. Some expropriated and arrested grandmas, some faked children, some underage athletes, yes, yes, but nobody is perfect, especially not a big country. What remains? For me as a gem trader one thing stands out: 50.000.000 carat of Andesine. It turns out Andesine has won gold in scamming this year, even in the highly competitive field of gem traders. For those who are not informed: Some, probably Chinese, mastermind bought 50 tons of pretty worthless Mexican feldspar years ago, artificially colored it red and created a new brand called “Natural Tibet Andesine”. Great name. Great origin. Especially for making it the Olympic gemstone and sell it to unsuspecting tourists at $500 per carat instead of $5, which is what it is actually worth. Well, well, in the gem trade such a plot is no novelty; it has been done many time and it will be done in the future. What makes this case so refreshing is the scale of publicity. While Omega and GE have paid millions to be associated with Olympia 2008, Andesine’s mastermind just spread rumors and engraved the five rings into the gem. 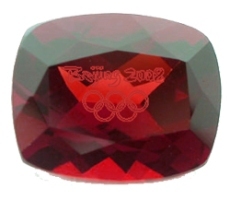 So, we have a fake gemstone sold in millions as fake Olympic gem. That is gold in all scamming disciplines. China, we forgive you. Nobody is perfect.